1. Using masking tape, tape the backing to a clean, hard surface right side down. 3. Carefully spread out your quilt top on top of the batting, right side up. 4. Pin your top, I like to use curved safety pins, spacing the pins a few inches apart. Make sure that your pins are going through all three layers! Also be mindful of your quilting design when placing your pins. Now we're ready to quilt! I've created a little video to show how I am quilting my top. I'm simply stitching on either side of the lines created by the warm vs. cool pattern. 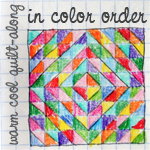 Warm Cool Quilt Along - Quilting a video by jenib320 on Flickr. After you've finished quilting, trim off your batting and backing and square up your quilt top! Warm Cool Quilt Along Tops, a photo by jenib320 on Flickr. Wonderful tutorial. Beautiful quilt. I love the warm and cool colors. Awesome tutorial. I'll be quilting away this week and next. Thanks for hosting such a great quilt along. I've ordered backing, hurry up international post, and then I'm on to quilting too. I have a question about starting and stopping your quilting - do you reverse a few stitches or run over the beginning again when you've finished the square, or do you leave long tails, knot and pull the knots through to the center? Thanks! I love how you're quilting your Warm/Cool quilt... very neat! I've just started a warm cool quilt in pastels for a friend's baby. It's such a great design, and so versatile in how you can arrange things. I have the HST's ask made and ironed, and now I get to figure out how I want to put it all together. Thanks for the Tute! This has been SO much fun!!! I love the basting and quilting part...it is just the binding I hate, so hopefully I can learn something new next week! hehe. I love your quilting btw, I think I will do something similar. I'm also curious about how you stop & start. It looked like you didn't back stitch at the beginning when you started your line of quilting. How did you finish when you got back to where you started? Thanks for putting so much work into this great QAL! Just found you today. I love your quilt and the quilt-a-long. You're added to my reader! Hi Jeni, I like your warm cool quilt a lot and I´ve done one by myself. I decided to use it as pillow and I really love it. Do you want to have a look? Great tutorial! Just wondering what type of batting you'd recommend and does it need to be pre-washed? Thanks Jeni! I always have trouble with basting, and I use the same method you do with taping the backing down, layering the batting and quilt top, and then pinning with the curved safety pins. Should I be stretching the backing taut when I tape it down to the table, or just smoothing it flat without stretching? No matter how careful I try to be, I always end up with ugly little tucks and pleats on the back of my quilts.